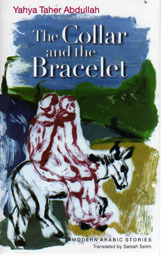 The winner of the 2009 Saif Ghobash – Banipal Prize for Arabic Literary Translation is Samah Selim for her translation of The Collar and the Bracelet by the late Yahya Taher Abdullah, published by the American University in Cairo Press. The runners-up are Michelle Hartman for her translation of Iman Humaydan Younes’s novel Wild Mulberries, published by Interlink Books, USA, and Elliott Colla for his translation of Ibrahim al-Koni’s Gold Dust, published by Arabia Books in the UK and by AUC Press in North America. Have you read The Collar and the Bracelet? Would you like to post your views on the site? Tell us your views, by email in the first instance, by clicking here. Have you read Wild Mulberries? Would you like to post your views on the site? Tell us your views, by email in the first instance, by clicking here. Francine Stock goes on to say: “The descriptions – whether of the camel’s betrayed gaze, the man clinging to his crazed beast as it careers through the sands or the growth of a stealthy plant in the sand – all impress themselves vividly and permanently in your imagination.” Marilyn Booth describes the author Ibrahim al-Koni as a “magnificent novelist”, and says that “this translation does justice to the beauties of a story far removed from the experience of English-language readers”. Have you read Gold Dust? Would you like to post your views on the site? Tell us your views, by email in the first instance, by clicking here.